Dreaming of golf? Amidst the soft sandy beaches of Sunset Beach, stunning mountains and the quaint fishing village of Calabash are some of the world’s most spectacular world-class golf courses. Enjoy excellent golfing year-round or watch the pros at one of the many events held at our golf courses. In the quaint fishing village of Calabash is the immaculate 18 hole public course designed and created by Rick Robbins, a former Jack Nicklaus design associate. Crow Creek offers a scenic and enjoyable yet challenging year-round golfing experience. Perfect playing conditions, an on-site restaurant and a fully stocked pro shop make Crow Creek Golf Club one of the most popular destinations for golfers in the area. Set on a 1,700 acre plantation style resort, the creation of Clyde Johnston & Willard Byrd, Brunswick Plantation has been voted one of the Top 50 Golf Communities in the US. In the historic village of Calabash and just a few miles from Myrtle Beach and Sunset Beach, Brunswick Plantation offers three courses with 27 challenging holes in a beautiful setting of forest, lakes and creeks back- dropped by the Atlantic Ocean. Relax at the 19th Hole Bar & Grill or visit their full-service Pro Shop. Brunswick Plantation also features a driving range. Historic, Old World charm welcomes you on arrival at Thistle Golf Club in Sunset Beach. The Clubhouse is inspired by an ancient Scottish castle set amongst wildlife, maritime forests and wetlands. Share a drink or meal with friends at the authentic Scottish Pub, then step back in time as you experience one of the very best courses on the Grand Strand, rated a 4.5 star course by Golf Digest. Popular among golfers of all levels, Thistle Golf Club features 27 holes on fairways, bunkers and flawless bent grass greens. Enjoy a day of spectacular scenery and superb golf at one of America’s finest fairways. Sea Trail Golf Resort is home to three signature courses all offering challenging golf to players of all levels, only minutes from the sandy beaches. 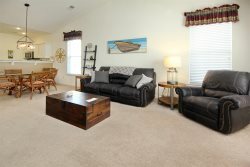 Sea Trail has exceptional amenities with two clubhouses, golf shops, dining, a driving range and a Golf Learning Center. The Dan Maples Course is a traditional par 72 course along the Calabash Creek, alive with nesting ospreys and wildlife, surrounded by live oaks and tall pines. The Rees Jones Course is a par 72 championship course of 18 holes on wide fairways surrounded by lakes. The William Byrd Course challenges every level of player, with 18 holes of championship golf set amidst trees, large lakes and ponds. A challenging play for all golfers. Oyster Bay is a beautiful and diverse course, set amongst fresh water lakes, maritime forest and wetlands, just minutes from the ocean in Sunset Beach. Architected by Dan Maples, this par 70, 18 hole course is an excellent design in a beautiful natural setting of tree-lined fairways, cavernous bunkers and rolling greens. Two island greens and great design tricks make this a challenging and rewarding course for all handicaps. Rivers Edge is a spectacular Arnold Palmer Signature Golf Course situated on the banks of the Shallotte River. A “stunning masterpiece” and “crown jewel”, the course winds its way along river banks, marshlands and freshwater lakes. Listed by Golf Digest as one of "America's 100 Greatest Public Courses", Rivers Edge gives players a tough challenge on 18 holes in a spectacular scenic setting. Relax at the elegant waterfront clubhouse with panoramic views of the Shallotte River, whilst enjoying a meal at the restaurant. Rivers Edge is possibly one of the most spectacular courses you will ever experience.